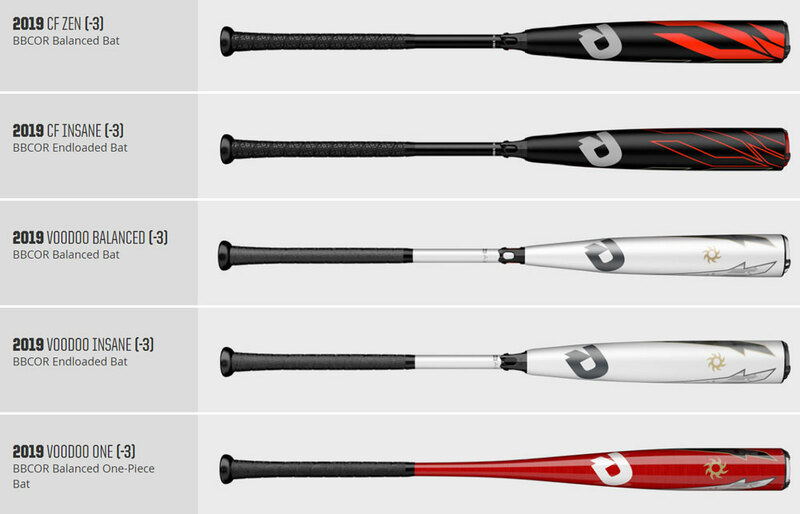 There are FIVE new bats in the 2019 DeMarini BBCOR Bat lineup! Check them out, and read below the what is new in each model. Custom bats can be ordered now, but won’t ship for another month or so. The bats shown below began shipping August, 2018. 2019 CF Zen BBCOR Bat $449 – The top of the line, balanced 2019 CF ZEN model gets new Paraflex Plus Composite, a unique and proprietary blend of composite and epoxy that DeMarini says is their best ever. Usually that means better pop and more durability over the previous model year. 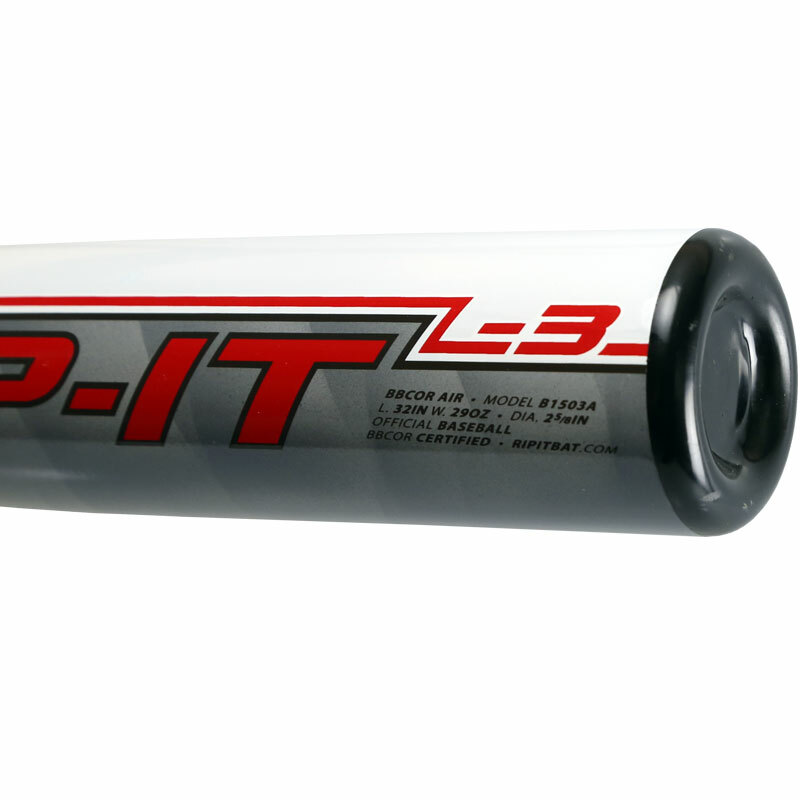 The 3 Fusion Taper adds to the balance of the bat, while helping kill vibration felt in your hands. 3 Fusion end cap redirects energy back in the barrel of the bat on contact for added distance. 2019 CF Insane BBCOR Bat $449 – The other CF BBCOR bat in the line up uses the same Paraflex Plus Composite (their best ever) as the CF Zen, but the CF Insane has a slight end load for added power through the hitting zone. The CF Insane also has the same 3 Fusion Taper for optimal weight distribution and vibration reduction, as well as the 3 Fusion end cap to direct energy into the barrel of the bat/ball instead of letting it escape out the end via vibration. 2019 Voodoo Balanced vs Voodoo Insane BBCOR $299 – The Balanced Voodoo is of course, balanced. Meaning less weight at the end cap, making it easier to swing and generate bat speed. The Voodoo Insane is End Loaded, which adds mass and weight toward the end of the bat, requiring more strength to swing the bat, but rewards the hitter with added power. The Voodoo Insane has a larger barrel profile than the Voodoo Balanced because of the ability to have more weight at the end of the bat. Both bats are two piece construction with an aluminum alloy handle and Paraflex Plus Composite (Same as CF Zen and Insane). Both two piece Voodoo bats use the same 3 Fusion connector as the top of the line CF bats, as well as the same 3 Fusion End Cap to help redistribute energy back into the barrel of the bat and into the baseball. 2019 Voodoo One BBCOR Bat $249 – The “One” is an “Ultra Balanced”, 1 piece bat made entirely of DeMarini’s exclusive X14 alloy, a lightweight performance aluminum alloy blend. The Voodoo One gets the 3 Fusion End Cap for energy redistribution to the barrel of the bat, as well as a nice red glossy finish, and premium performance Camo-D bat grip.